When Douglas Coupeland wrote about Generation X at the start of the 1990s, there was a sense of his isolating not just a new demographic, but of an anthropologist stepping into unmapped territory. Since then, thanks to Richard Linklater and Kevin Smith, the archetypal slacker has become such a clownishly familiar figure in the movies that you'd think there could be nothing new to say about the weary business of working jobs you hate in the town you've outgrown while the girl you have designs upon speeds off into the distance. It's all so, like, y'know? Sixteen years on from Linklater's Slacker and the Generation X-ers have been overtaken by the Ys, but films about over-educated, under-whelmed kids slouching away from the fallow field of corporate endeavour are undergoing a renaissance. 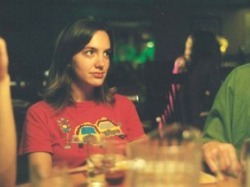 Writer-director and actor Andrew Bujalski's debut Funny Ha Ha (made in 2002 but, appropriately given its diffident tone, arriving in the UK five years later) is an excruciatingly well-observed comedy about almost nothing at all, its reticence concealing Bujalski's ear for Woody Allen-esque dialogue and sharp eye for passive-aggressive game-playing. The whisper of a plot follows 23-year-old graduate Marnie (Dollenmayer). Introduced peering out drunkenly from behind a curtain of hair while attempting to get a tattoo of a cow, Marnie is smart, sweet, listless and lost and, although she doesn't know it, she's the subject of several of her male friends' attention. Alex (Rudder) is the irritatingly bouncy guy for whom Marnie has a thing, and he strings her along shamelessly. Dave (Paige) is going out with Marnie's best friend Rachel (Schaper), but when Rachel is out of sight he and Marnie share a guilty kiss. Mitchell (played with jittery, apologetic persistence by Bujalksi himself) is the amiably pathetic co-worker Marnie meets at a data-inputting temp job, and her inability to return his feelings is the closest the film has to a conventional driving force. Like Kelly Reichardt's 2005 film Old Joy, Funny Ha Ha represents a new maturity in its approach to the formless anxiety of life for middle class white kids. It's impossible to count the number of conversations here which begin "Ah, I dunno," and for Marnie and her friends the fumbling isn't sexual, but towards some sort of certainty. With its summery days in airy apartments and beers on the porch before another party, oh, somewhere, Bujalski's characters enjoy a comfortable disengagement which ought to render them unbearable. Their relentless self-absorption makes Woody Allen's Alvy Singer from Annie Hall look like a Zen master who's conquered his own ego. A mysteriously unannounced wedding and a dropped beer bottle are the film's two most significant events, but Funny Ha Ha doesn't aspire to big issues or high drama. Instead it's about the evolution within Marnie of confidence and a sense of purpose, even if that ambition is restricted to staying off the bottle and playing a better game of chess. Slacker and Clerks were all about exaggeration; their hopped-up momentum reflected the speed at which the merry-go-round was turning in the early 1990s. ('Tales For An Accelerated Culture' was the subtitle to Coupland's novel). Funny Ha Ha, like Old Joy, is on a mission of understatement, happy to hold its relationships up to the light and acknowledge that life is frequently just an aimless mess. Bujalski's film opens in media res and it doesn't so much end as just stop. 'Slice of life' is too grand a term for this drift through beery nights and hungover mornings during which Marnie and Co. reach tiredly for self-assurance, or even just the end of a sentence. Yet from this unprepossessing material Bujalski fashions a lingering little film in which who says what, where they looked and how they seemed become matters of the utmost importance.